Yes! With these pouches your flowers will seem heavenly! Ideal for the plant urban lovers who do not like to place plants in their conventional way! 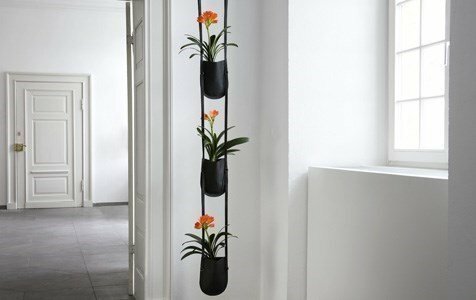 Hanging from the ceiling, these bags will hold your plants in an sublime way.... giving the room a fresh and delicate look! Surprise is this assembly line's middle name. Connecting more than one bag, Urban Garden can be turned into a delicious curtain in your kitchen where delicious herbs will rise. Or it can also be turned into a "wall", breaking two rooms in the most original way ever! All sizes come with zipper straps, inner pouch with draining process, expanded granulate clay and water level indicator. Be original! Choose Urban Gardens and revolutionize your plants! Ideal for indoor plants such as herbs, flowers and the traditional indoor plants. It is a low maintenance object, and its inner water system assures the needed moist and humidity to all conventional plants. Urban Garden plant sacs designed by Patrick Nadeau for Authentics.